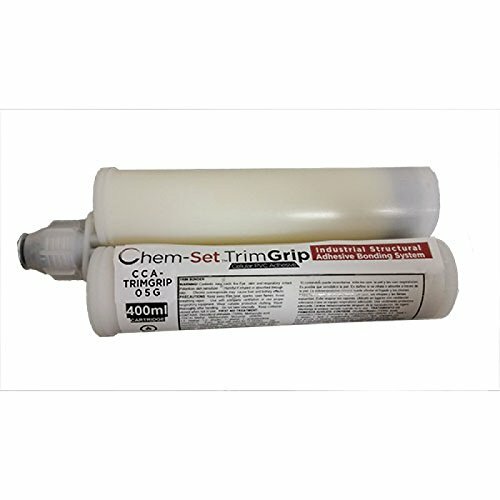 The ChemSet TrimGrip Adhesive from Chemical Concepts contains everything a contractor needs to permanently bond, laminate, and fill gaps or nail holes in Cellular PVC or natural boards and trim. Formulated for outdoor use, TrimGrip adhesive can be used for joining or laminating sections of trim, columns, or cornerboards; bonding aluminum cleats to PVC window and door trim moldings; and filling gaps and nail holes for a smooth look. Fill Gaps- Use TrimGripTM adhesive to fill the gaps left between edge of house and trim board. By filling the gap you will achieve a seamless look. Fill Nail Holes - Fill nail holes simply and quickly with TrimGripTM adhesive, available in a convenient 400ml cartridge. Fill the hole with adhesive, wipe away any excess for a clean, smooth surface. Window/Door Trim - Bond trim board around windows or doors for a custom look on your house. The first impression is a lasting one. Make a statement and increase your curb appeal. Fascia Trim Boards - Bond and fill all CPVC trim boards (such as AZEK®, Koma®, Fypon®, etc). Fill Joints - Fill in joints that are created when trim boards meet. If you have any questions about this product by Chem-Set, contact us by completing and submitting the form below. If you are looking for a specif part number, please include it with your message.